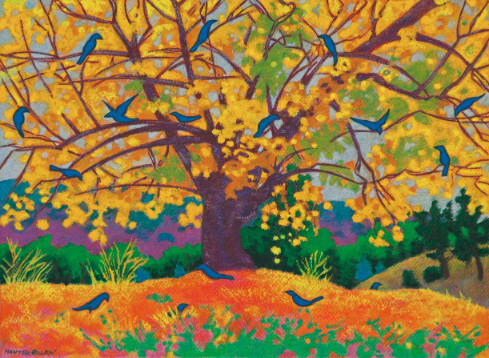 An observation of early sunlight behind a fruitless mulberry on the edge of a hill, and the many blue birds in the branches and on the ground, inspired this combination of colored pencil and oil pastel on pastel paper composition. 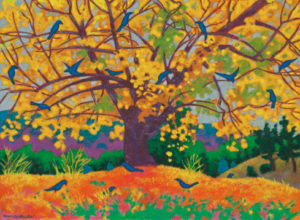 The spots of bright light visible through the thick yellow and green foliage with the foreground primarily in shadow charmed my sensibilities. I started with colored pencil then enhanced that layer with oil pastel. Further texture was added by scraping the layers of oil pastel into shapes. I continued to alternate between the pastels and pencils, until I reached color-saturation nirvana.